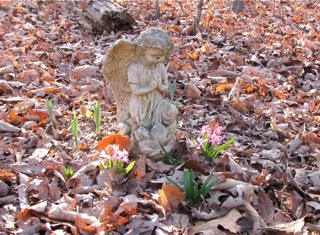 On February 1st I noticed that the wood hyacinths on our cat's grave were blooming. We buried Skipper in a spot out from the screened porch so we could always be thinking of him. I was amazed to see that they were already in bloom. My neighbor has regular hyacinths and has full sun in front of her porch. Her hyacinths are in full bloom also, so we really are looking a lot like Spring around here. The daffodils are coming up, as are the irises. The hellebores are in bloom too. They are such fascinating plants with such an unusual bloom. Another flock of American Robins came through one day when that night's low was going to be 28. I'm hoping we won't have any horrible freezes that affect all this early migration that seems to be going on. 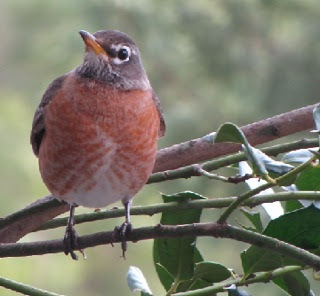 Get more info on robins and their migration. It's amazing how fast they can eat the holly berries, gulping them down like we might eat popcorn. We're certainly having a bit more winter than we've been having. I guess it's to be expected with so many lovely days to enjoy. The low temps are below freezing but daytime is still in 50's. On our south-facing deck, it's a warm place to enjoy some outdoor time. The temps are coming back up though, with nothing below freezing for the next week. Today will be a high of 62 and I will spend some time sitting on the screened porch. The country's food supply can really get affected by this weird weather. We're getting delicious strawberries at the store from Florida because they've had an early bumper crop with the taste of more mature fruit later in the season. It's definitely strange eating 'real' tasting strawberries in early February. 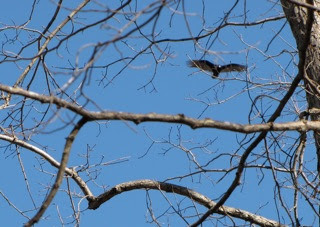 We also saw one Common Grackle. Pretty odd. I wonder if he got off-course since they usually travel in flocks and actually don't arrive here until March. I've not seen any more since then. He sat for a long time under a pine tree. I wondered if he felt lost and alone. 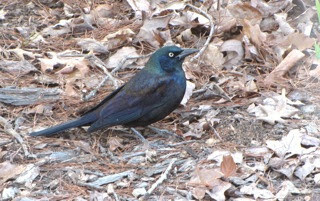 Or maybe he was the grackle that I rescued five years ago after it hit our deck door. The grackle can live up to 13 years so it's definitely possible. It's amazing the things that birds remember. I wouldn't consider it an insult to be called bird-brained these days. Before the cold weather hit, I spent some time on the hammock. It was a gorgeous day with a bluer than blue sky and the sunshine made the trees look like works of art. Of course they really are God's works of art. 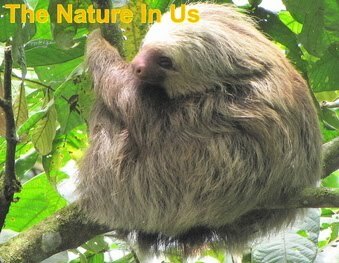 It's amazing that everything He created reproduces itself so we have a continual feast of His masterpieces of Creation. There's something about being suspended above the earth that just feels right. Although I wouldn't want to sleep in hammocks like the folks on Gilligan's Island. We're very fond of our pillowtop mattress. I was so busy getting Squeek through another crisis after her dental surgery that it took me a week after she was well to realize that she is deaf. It's been quite a shock to me and it certainly explains some of her unusual behavior. I can't imagine what's it's like to suddenly lose your hearing. That stress was probably a factor in her getting sick after the surgery. She has such a weak immune system with the FIV. The first thought that came to mind was that the anesthesia may have caused it. When I searched for info online that was definitely the situation, although they said it wasn't common. The factors that seemed to create the problem were when a cat was having dental or ear work, and also if the cat was elderly. Of course, Squeek fit on both counts. She'll be 16 in July. The veterinary research I read online said it was permanent hearing loss, but that's only their report. I believe in better things! She's a real trooper. We have been praying over her and she's beginning to hear some higher pitched sounds. 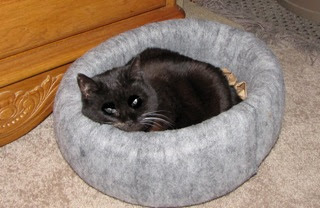 I'm working on my own unbelief about God's healing for me and seeing God heal my cat shows me how much He loves me. We need to see Truth rather than just the facts. It's hard to look beyond the physical realm, but we must. With each stripe on Jesus' back, He bore our diseases and sicknesses so we wouldn't have to. The revelation lies in us seeing through our spirit where all these things have already been done, and getting our soul to line up with the spiritual reality instead of focusing on the physical reality which is just smoke and mirrors from the devil. Our squirrels are such great performers. They delight us daily with their antics and dedicated time to tank up on any food they can find. The holly berries are a real treat for them also. They begin eating them when they are still green and enjoy them throughout winter. 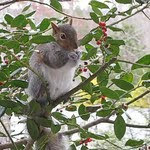 View video of squirrel eating holly berries. I'm still dreaming of a trip to the Everglades, but right now we're dedicated to the task of learning more about healing. There's something we just don't understand, but it's us, not God. His promises are ever true, so we shall seek revelation for eyes of our heart to be enlightened, as Paul prayed for us to have (Ephesians 1:18). I would appreciate your prayers as Paul prayed. That we might know the rich inheritance we have as Christians. I am convinced we miss out on so much, thinking that salvation is simply the pass to Heaven, when God wants so much more for us down here. We just don't understand the grace that allows us to simply receive all that Christ died to give us. The devil will kill, steal and destroy, but Jesus won the battle so that we would have power over him. We are all given faith, but it's the unbelief that we have stored up from living in the realm of 5 senses that keeps us from experiencing what faith can get us. We have to tune into that 6th sense, the spiritual realm, so we can walk by faith and not by sight. We're still puzzling. 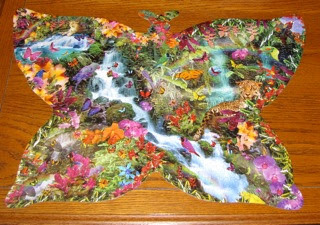 My friend, Robin, sent me a beautiful Rainforest Butterflies puzzle. I thought it would be really hard without a straight border, but it just meant you couldn't do the border first. So I did as much as I could get together and then worked on it in pieces based on the colors, etc. It turned out really cool and is certainly now one of my favorite puzzles. P.S. If you enjoy this newsletter ... share the website with somebody else. Maybe you know of somebody who needs something in this issue. There's a "Share This" option on the right side. Thanks!